“Yes,” replied Mr Blair in his dressing room, as he peered at his reflection in the illuminated mirror. “Really? Do you think?”, said the former-PM as innocently as he could. It’s good news, bad news for Natalie Bennett. Good news: she got an interview on BBC Radio 4’s The Today Programme. Bad news: John Humphrys signed it off by saying thank you to “Caroline Lucas”. NHS? Blair? Neither of these seem to be engaging with voters as much as the humble hot dog. During one of his many simple, family barbeques with employees from Getty Images, David Cameron was seen eating a hot dog with a knife and fork. Which is the sort of thing that you might initially gloss over, but, when you dwell on it, it just proceeds to baffle more and more. Does he not trust himself to use his hands? And talk about not tough enough to face Vladimir Putin? He isn't tough enough to handle a foot-long wiener. 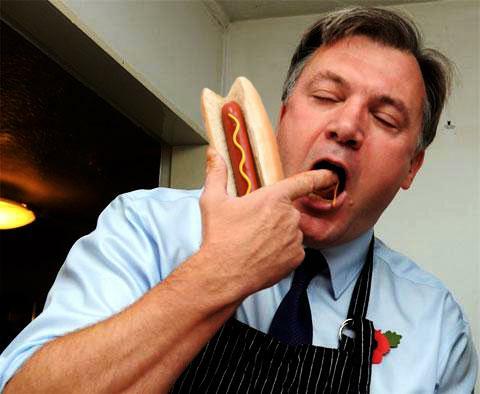 In the interests of balance, though, here is a photograph of Ed Balls eating a hot dog in the usual fashion. Nothing crystallises the choice at this election more than these two photographs. What rich pickings we have. Minutes to go until his speech, and Blair is talking to a young Labour supporter backstage about his heyday and his plans. “Is this a comeback?” asks the fresh-faced Blair-fan. The young Blairite has never been so enthralled, and he watches Tony agog. The teenager looks at him, the sadness of the man. David Cameron is in Northern Ireland at the moment. Today he is touring all four nations in the UK, and is currently visiting the set of Game of Thrones. Insert your own joke here. Backstage, Tony looks out from the wings with a steely glare. The familiar glint lingers still, somewhere behind his determined expression. Just before he walks out, he mutters “Let’s show them how it’s done”, and then it’s like an old entertainer, returning to the stage and showing everyone he’s still got it. Imagine Bruce Forsyth, if he’d committed any atrocities (apart from his hosting of the later series of Strictly Come Dancing). At Labour HQ, there is an immediate post-mortem of the speech. Mr Cameron takes a minute during one of his flights to ask a Tory advisor about the day’s events. “How was Blair?”, asks David. On his way to his speaking engagement, Tony listens with glee to the radio. His speech is well-received, and regardless of his past and the controversy that surrounds him, he is praised for raising the tone of the campaign. 1 Events depicted may differ from actual events. In fact, this is a work of fiction, with some facts. But mostly, it's nonsense.